Ah, Mallorca - one of the true jewels of the Mediterranean. A long-time vacation hotspot in the truest sense of the word, the island Mallorca - or Majorca, if Spanish isn't your native tongue - has always been a destination worthy of its touristic leanings. Moody mountains, the beautiful blue of the Mediterranean, and a panoply of gorgeous beaches all combine to create a truly stunning landscape. 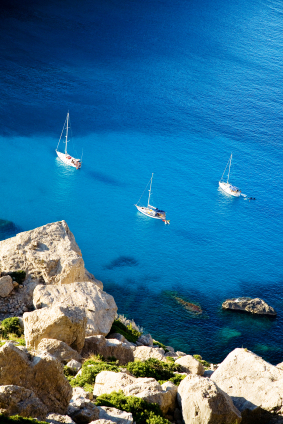 However, there's more to Mallorca than just beaches and nightlife. As with many towns that grow around the tourism industry thanks to their natural beauty, the main port and city of the island, Palma de Mallorca, has attracted more than its fair share of the artistically inclined. And, as with many such places, some of those who come to visit eventually find themselves falling so deeply in love with the place that they never leave. One such visitor was the famous Spanish painter, Joan Miro, a native of Barcelona who fell so deeply in love with the island that he made it his adopted home in 1956, where he lived and worked until his death in 1983. As a result, Palma de Mallorca boasts one of the most impressive Miro galleries in the world, the Fundacio Miro, where visitors can see a wide-ranging collection of his works, and visit the actual studios where he painted some of his most famous works. Miro isn't the only reason to visit Palma, however, as there are several other galleries that are worthy of note. One of the most impressive is the legacy of Juan March, who was, at one point, the sixth richest man in the world, the Museu Fundacion Juan March, which is home to works by the most influential and well-known Spanish artists. The collection features a number of additional works by Miro, as well as works by Salvador Dali, and in 2009 added a new wing to the museum entirely dedicated to the works of Pablo Picasso. A little more off the beaten track is the Es Baluard Museu, which features a number of contemporary artists who have a connection to the Balearic islands and the Mediterranean. The building itself is almost a work of art that spans the centuries, as the gallery is partially housed in a 16th century Spanish fortress, and partially within a beautiful newly-constructed minimalist wing. It features original works by the likes of Cezanne, Picasso, and Gauguin, as well as the ever-present Miro. If you can tear yourself away from the stunning beaches and moody Mediterranean lighting, these galleries are guaranteed not to disappoint.